I have been very conscientious spending at least an hour a day on my UFOs. 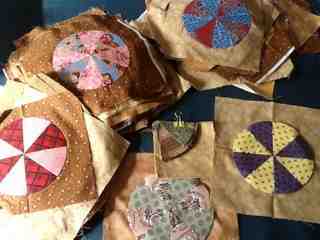 Today it's Pies n tarts; I have three more pies to sew, then all 144 pies are complete. I have 8 more tarts to piece then I'll be able to start sectioning this quilt together (will take a little while lol). I love your Pies n Tarts. Having a routine is the best approach with some quilts, especially if there's a lot of repetition. Looking forward to seeing it all together.....and the Angels Story. YOu are doing a fantastic jobDdeb, they look great.. I love your pies n tarts too, looking beautiful! Good on you making some time for yourself AND getting some UFO progress. It's very satisfying. Pies and Tarts looks lovely. You Go Girl!!! Well done! Looks great. Wish I could say I was that far with mine.